The 23 enigma is a well-known underground cultural phenomenon which owes its popularity in part to its frequent mention in the Illuminatus! trilogy by Robert Shea and Robert Anton Wilson. Among those who investigate the enigma, many with a wink and a nod, the presence of the number is thought to be the hallmark of a vast conspiracy, perpetrated by a secretive global organization. Some have attributed it to the dread Illuminati, but Wilson and Shea maintain that the real origin of the mystery lies with the Discordian sect of the Justified Ancients of Mummu. Shea and Wilson credit William S. Burroughs with uncovering the mystery, which he relates in his story of the ferryboat captain Clark, whose ferry sank after 23 years without incident. The number seems to be everywhere one looks, acting as a beacon of the strange. A number of artists and musical groups in the industrial genre have latched onto the number over the years in order to tap into its conspiratorial chic. Essentially, the more you look for the number 23, the more often you will notice it, to the exclusion of other numbers which may actually be encountered with greater frequency. Now a major marketing campaign has tapped into the power of this enigma. Dr. Pepper lore, and now their advertising claim that the drink’s distinctive flavor comes from a blend of 23 fruit flavors. 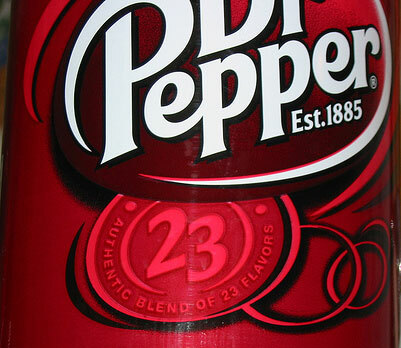 The bottle label has even begun to sport an “authentic blend of 23 flavors” badge with the number prominently displayed. Accompanying this change is a new media campaign which implies that “23 is everywhere.” This caught my interest, as I am both a fan of the drink, as well as a student of the 23 phenomenon itself. My screen name on a number of online haunts is in fact, Vargr23. Trying to determine if there was anything to this connection, I located The Highly Unofficial alt.fan.dr-pepper FAQ online. Although the FAQ addresses the 23 fruit juices claim, there is also information, some of it unfortunately unverifiable, that refutes the veracity of this claim. Having read the account in the FAQ of a 67-year employee of the oldest Dr. Pepper bottling plant in the world, the claim of 23 flavors brings to mind many of the pitches that a sideshow man I know uses to get folks behind the banner line. It’s a harmless bit of exaggeration to better immerse the marks into the experience. In a market supersaturated with products that are often difficult to distinguish from one another, each is trying to find an edge on its competitors in the war for our brand loyalty. A creative advertising campaign which avoids the filters that consumers inevitably develop as a result of living in the era of media and marketing overload is the first step in getting this edge. Although the question is interesting, the actuality of whether or not the flavor of Dr. Pepper comes from a blend of 23 flavors is irrelevant to the matter that I’m most interested in. Someone who has a very good understanding of the popularity of conspiracy theories and the power of a tried and true underground shibboleth has created a marketing campaign which has a massive amount of pre-existing mind share. For this masterstroke I applaud the ingenuity of whatever individual or team produced this project. The very ease with which this hipster meme was co-opted demonstrates with unquestionable clarity just how easy this sort of thing is to accomplish. Any portion of culture, whether it is pop or underground, is ultimately vulnerable to use as a tool of persuasion. Previous Previous post: Fourteen Internet years ago.